Dingo Indulgence Cheese Flavored Mini Rawhide Chews provide a delectable, decadent treat for the dog that deserves no less! These real meat and rawhide chews are made with premium beefhide and real chicken to keep your dog satisfied, with NO ingredients from China! 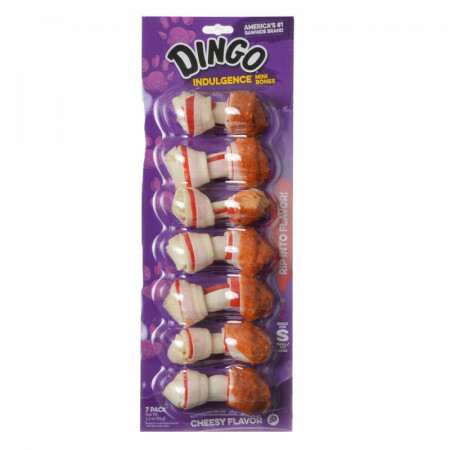 Now you can feel just as good feeding them as your pooch does chewing them! Chewing rawhide helps promote healthy teeth by removing plaque and preventing tartar buildup. Natural rawhide, premium chicken and pork and delectable cheese flavor - now that's a treat every dog will love. Ingredients: Rawhide, Chicken, Water, Maltodextrin, Potato, Pork, Sorbitol, Salt, Corn Sugar, Potassium Sirbate, Cheese Flavor, FD&C Yellow #6, FD&C Red #40. My 3 month puppy (pit) loves these!! I give her one a day as a treat/reward for good behavior. It usually takes about 15 minutes before its completely gone.